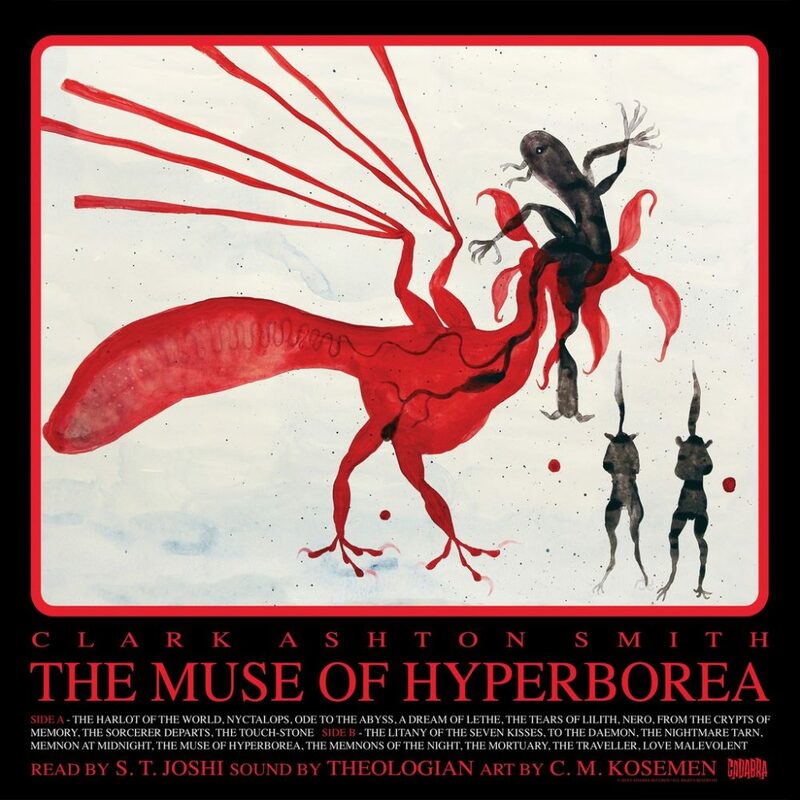 ‘The Muse of Hyperborea’ by Clark Ashton Smith [1893-1961] is Cadabra Records first fully curated album of his material (excluding the “live” long player – Live in Auburn – The Elder Tapes), and the second release after the 7 inch EP ‘Inferno’, which introduced many Cadabra fans to Smith’s arcane poetry. So be prepared to lose yourself in the maze of Smith’s ‘cosmic’ mind, as he takes you on a journey to far off lands, distant planetary systems and to future possible worlds. Ready yourself to smile at the preposterous, to be panicked by the bizarre, to be fearful of the terrifying, to wonder at the order and chaos of Smith’s poetic form, a cure all for the world weary and jaded heart. 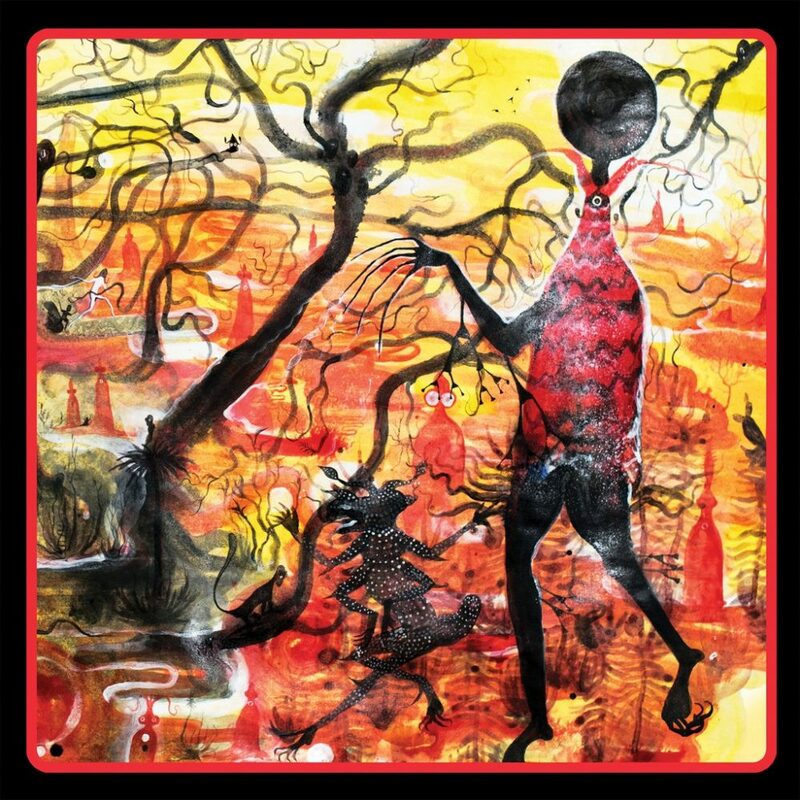 There is more here than found in the dreams of mortals, so play your copy of ‘The Muse of Hyperborea’. 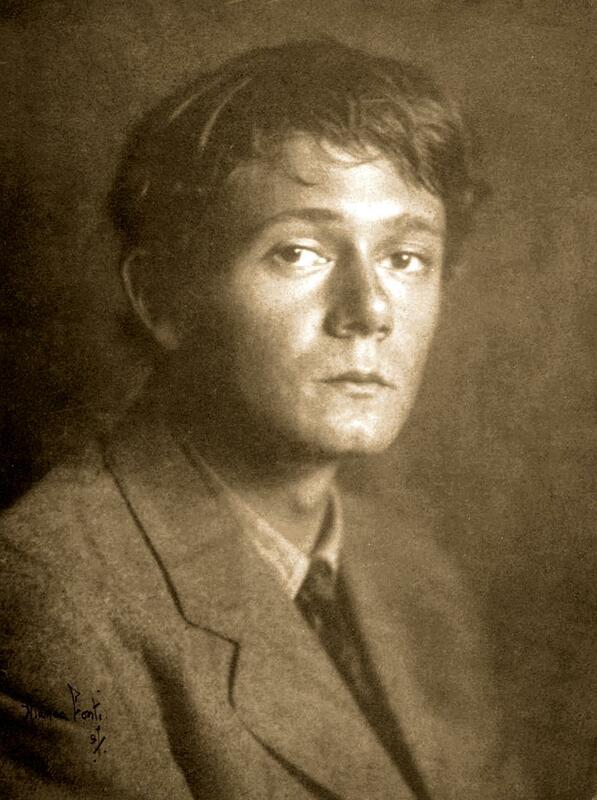 Clark Ashton Smith was born January 13, 1893 in Long Valley, central California, near the town of Auburn. For about four years he attended a grammar school in Auburn until his parents withdrew him, at which point he educated himself; teaching himself Latin and reading his way through Webster’s unabridged dictionary. As early as 1904 Smith was producing prose set in the Middle East or India, and crafting poetry in similar settings. In 1907 he wrote his first novel ‘The Black Diamond’ which was only published in 2002. By 1910 he was publishing poetry in magazines such as Munsey’s and Overland Monthly, and short stories in the Black Cat. In 1911 he made contact with George Sterling [1869-1926] who was a renowned poet in California, having made a name for himself writing ‘cosmic’ and horrific poetry with the guidance of Ambrose Bierce [1842-1914]. He never really made a reputation outside of California where he was known as the “King of Bohemia”. Poetry was Smith’s main focus until 1925, guided by Sterling he published ‘Odes and Sonnets’ (1918), ‘Ebony and Crystal’ (1922), and ‘Sandalwood’ (1925). However Smith wrote formal verse, unpopular among the intelligentsia due to poets such as T. S. Eliot who favoured free verse. Smith also used obscure language and themes that were not popular with the average reader. Smith came into contact with H. P. Lovecraft [1890-1937] in 1922 when Lovecraft wrote him an appreciative fan letter praising some of Smith’s early poems. Smith in turn read Lovecraft in Weird Tales (founded in 1923). Around 1925 Smith began writing weird fiction as his poetry had failed to gain him an audience, his stories being published in Weird Tales. However by 1935 Smith’s creativity had all but dried up due in part to the pressure of looking after his ailing parents, his mother dying in 1935 and his father two years later. Smith was also hit badly by the death of his friend Lovecraft on March 15, 1937, even though they had never met in person. Clark Ashton Smith had no equals in the weird poetry field of his day and probably still hasn’t. S. T. Joshi [Born 1958] hand-picked the 18 poems and is a scholar of Lovecraft and the weird and wonderful. His books include ‘H. P. Lovecraft and the Decline of the West’ (1990), ‘The Modern Weird Tale: A Critique of Horror Fiction’ (2001), ‘The Weird Tale’ (2003), ‘The Evolution of the Weird Tale’ (2004), ‘I Am Providence: The Life and Times of H. P. Lovecraft’ 2 Volumes (2013), ‘Unutterable Horror: A History of Supernatural Fiction’ 2 Volumes (2014), to name a few as well as editing the ‘Lovecraft Annual’ and ‘Black Wings of Cthulhu: Tales of Lovecraftian Horror’. According to Theologian (Lee Bartow) who imagined the background ambient music, Joshi’s voice has an almost baritone quality, and he has an unique way of delivering his readings, so that Theologian follows Joshi’s cues for much of the score. Theologian’s Lee Bartow uses a minimal approach to the score for ‘The Muse of Hyperborea’, there is no aural environment, but in Barstow’s words “an almost psychedelic tone by way of arpeggiated synth and dramatic orchestral strings”, to create a ‘cosmic’ soundscape. Barstow believes that the continuing process of successive projects informs the development of new work in intriguing ways. This album is a treasure as precious as that ordinary looking grey pebble that turns out to hold the answers to the universes secrets, dare you play it a second time or do the common illusions of the everyday mundane satisfy? 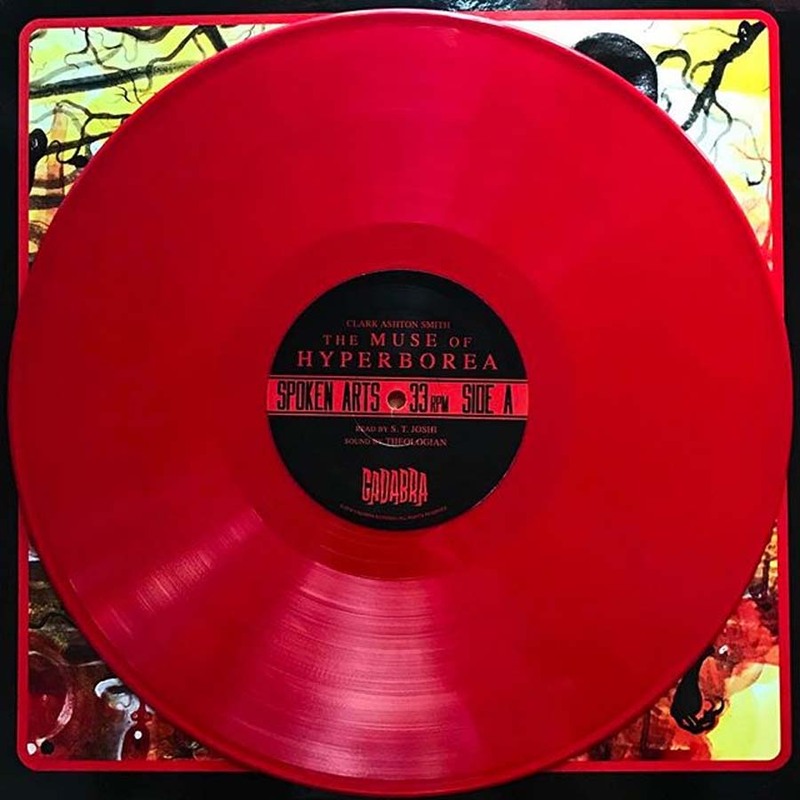 Cadabra Records “The Muse Of Hyperborea” features 18 poems (9 per each side of the 33rpm long player phonograph) and is pressed on opaque red vinyl and housed in a deluxe tip on jacket sleeve, which features the strange and surreal art of C.M. Kosemen. 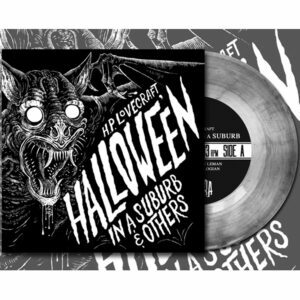 Limited to 300 copies worldwide, this will surely find its way into the hands of weird literature collectors and vinyl enthusiasts alike. Once secured by the cognoscenti of spoken word horror, it will likely become a very rare and treasured item indeed. More information on Cadabra and the full current Cadabra Records catalogue is available here in the Psilowave Store. 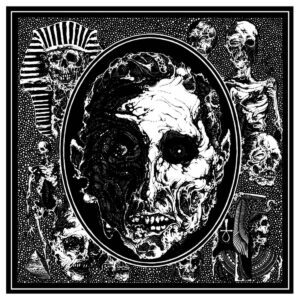 Access Cadabra Records Website directly.